Any other Bricksetters going to Brickfair Va? 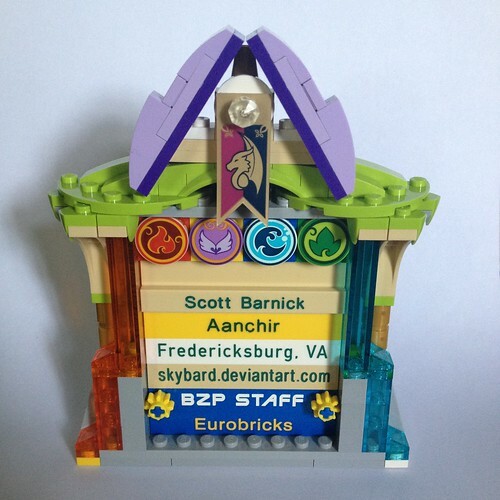 I am attending Brickfair Va for the first time this year, and was wondering if any other Bricksetters would be there as well. I already plan on meeting up with fellow Bricksetter @TheMaker37, and am always looking to meet fellow Bricksetters. I wish I could make it, unfortunately I live on the other coast. :/ I'll probably be at BrickCon in Seattle though. I'll be going-- my first BrickFair VA trip since 2008! It's been a while since I made it to one of the larger conventions! Awesome! Will you be coming for the week, or the public days? One question for previous attendees- what size cars are used for the Wacky Racers? As far as I know, there are no size restrictions. The Wacky Racers ramps are like a foot and a half wide if not wider. Although there are organized TFOL/AFOL events with them at specific dates and times, the ramps are set up through pretty much the entire event so that kids can build cars with the bricks in the Stay & Play area, so if you arrive earlier than the event for your age group there'll be plenty of time for a test run if you want to take time to make adjustments. I've been to BrickFair Virginia every year for seven years now, and this will be my eighth! I will be spending a lot of my time with fellow BZPower members and/or at the Bionicle table where most of my MOCs and artwork will be displayed, but I am also signed up for some games and will be attending some of the seminars, along with the usual browsing of MOCs and vendors. I'll technically be around the whole time-- but since both my wife and I are AFOLs and we've got our son with us, we may be switching off with him quite a bit! Not sure about the Wacky Racers-- from the sounds of it, they'll probably be using the Derby racetracks to race cars built from the play area, although I don't really know for sure. If that's the case, the derby is made from cars that are on roughly a 6x16 chassis, with whatever you want added on. But it could be that for the AFOL/TFOL versions that they don't use the chassis, and just let people free-build? Wow! Thanks! I'll be sure to say hi if I see you. I just have to ask- how do you attach a badge that big? Another question- what size sets are usually used for the combo builds? I'll be there too, so I can at least answer your first question. The regular magnetic strips used to attach the default badges are remarkably sturdy, to the point where this particular badge just uses one to attach to a shirt! However, if you go bigger, additional strips may come in handy—I assume they can be bought at craft stores, but in our case we have plenty handy from years of conventions (since a lot of the time we've opted to attach new convention bricks to existing badges rather than build the new one and apply the magnets to the back). Of course, if you're a prolific con-goer and intend on displaying all of your past con-quests, you might need to build them into some sort of lanyard, bandolier, or even a vest (I've seen variations on all three over the years). My brother and I tend to just stick the the most recent or relevant convention bricks in order to keep things from getting too unwieldy (and allow for more brick-built detailing). I can't really answer your combo build question since I've only done a similar event at a different con. At that event (this year's Brick Universe Raleigh) we were given two small $5 Creator sets. But I can't confirm that that's typical for all cons or for BrickFair itself. Up until this year I had never actually registered for any games, but after having been drafted into several games at other cons without pre-registering I'm finally going to give some more games a shot at this year's BrickFair! With regards to the size of my badge, also, I ought to mention that it's a lot lighter than it looks. It's only about 4 ounces/114 grams altogether (including the magnet), which for comparison's sake is lighter than my smartphone. I've seen many much larger badges over the years; you can check out the LEGO Brick Badges pool on Flickr for some other people's examples. As Lyi says, I currently have it on just one adhesive magnet bar, but I have spares in case it needs another. I wore it for a couple hours after I built it though, and it seems like one magnet bar will be sufficient. It also uses SNOT brackets on the back to lock it together so I don't have pieces coming off, which is pretty good advice for any brick badge much larger than the default ones. Another question- are used sets allowed for the Dirty Brickster? And another thing- where is there parking nearby? I am pretty sure that I saw both used sets and grab bags of pieces and minifigures used as Dirty Brickster gifts. Plenty of parking! The expo center has a lot of spaces and a Walmart is right across from it with a lot of spaces. I'll be there as part of Charm City LUG, we are in the back right corner near the Bingo. Parking close to the doors will be a little bit limited on the public days (Saturday and Sunday), but it's be easy to find parking a little bit further away. If you're staying at the Holiday Inn near there you can probably even walk from there to the expo center without too much trouble. Once the public leaves on Sunday it will be much easier to park closer to the expo center so you can pack up any MOCs you've brought. @Aanchir I'm probably not bringing a real MOC display this year, but that will be helpful for taking down GBC modules. I have to recommend Classic Plastic Bricks for anyone attending Brickfair VA (or any of the events he is at). He has a lot of old (lots of vintage, some heading for antique) sets and parts, as well as some more recent stuff. I daresay one of the few good vendors there (the best, in my opinion)- most other people just have sealed, not very old sets. I was able to get 2 Venators and a Malevolence, as well as several castle sets, electronics, and boat pieces as well as hundreds of loose parts for ~300 dollars. Awesome! Do you know what time? line to get in was absurd. Moved at a decent clip but was still around the entire building when we showed up at about 1020. The 25 minute estimate on the FAQ Regarding wait time is a big lie. We got in somewhat early and had about half an hour to check all the cool Mocs before it got to crowded to move. It was worth it to see the Mocs. Vendor pricing at most places was absurd. Didn't buy anything. I did see a couple booths with decent prices but lines were too long and I lost interest. Kids loved the Mocs and so did the wife and I. Glad to have done it once but wouldn't do it again. Even if you don't plan on bringing any mocs you should sign up for the Afol days before the main convention. There are events that are fun for all ages and usually the good deals are in the Yardsales (and early at the vendors). Dealing with huge public lines and crowds is something that BrickFair has struggled with in the past as well. Two years ago when The LEGO Movie was still fresh on people's minds it was extremely chaotic. I could tell that this year they were not entirely prepared for the size of the crowds either, since public hours on Saturday were extended to give more people a chance to get in and out. The experience tends to be a lot better as a registered attendee since the attendee badge keeps you from having to wait in line to get in, and you get up to three extra days to interact with fellow AFOLs without the hassle of the public crowds. I went to BrickFair as a public guest my first year there (2008), but since then I have always attended as a registered attendee. It's more expensive, but well worth it IMO. It was great meeting you, @SprinkleOtter! It was nice meeting @Aanchir as well! Would love to see what you got. Maybe I'll register in future years like you guys are suggesting as the public crowds were just too much. I remember you telling me about the yard sales, but I saw no sign of them and I couldn't find any information on where or when they were happening. After about an hour we had all had enough and it was getting too hectic. Yard sales were only for registered attendees- not tons of huge deals (you're in a room full of both buyers and sellers that are AFOLs), but I did get some good stuff.